Posted on Tue, Jan 24, 2012 : 11:18 a.m.
Former Michigan hockey star Carl Hagelin was the New York Rangers' final cut in training camp. He didn't stay in the minors for long. Hagelin was called up to New York on Nov. 25, and it doesn't look like he's going back down anytime soon. Hagelin has provided a boost to the Eastern Conference leading Rangers. 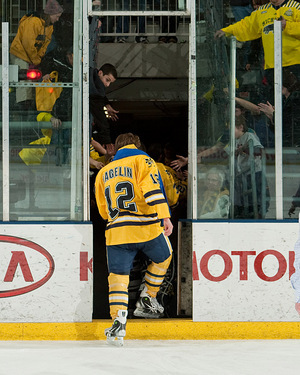 Just as unexpected as Hagelin's contributions, has been his journey from Sweden to New York by way of Ann Arbor. Hagelin is taking nothing for granted. Click here to read the entire article at NYTimes.com.